Buhari absent as Osinbajo presides over FEC meeting – Royal Times of Nigeria. 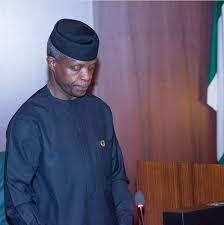 Vice President Yemi Osinbajo is presiding over the Federal Executive Council (FEC) meeting at the Presidential Villa, Abuja as President Muhammadu Buhari is again absent at the meeting. The meeting, which did not hold last week, according to the Senior Special Assistant on Media and Publicity to the President, Garba Shehu, was due to logistic and inability to circulate invitation to cabinet members due to the Easter holiday. Wednesday was however the second time Osinbajo was presiding over the meeting since President Muhammadu Buhari returned to the country from his medical vacation in the United Kingdom. There were less than 20 ministers in the Council chamber when the Vice President called for the rendition of the National anthem to signal the commencement of the meeting at few minutes past 11:00 a.m. The Minister of Education, Adamu Adamu offered the Muslim prayer while the Minister of Health, Isaac Adewole, said the Christian prayer.